IronGuard (IG) is a revolutionary, polymer based, bituminous repair system developed for the reinstatement of all types of ironwork on highways and airfields in asphalt and concrete pavements. Producing a permanent repair, IronGuard is a 100% on-site process and requires no subsequent maintenance. The system meets the requirements of HD27/04 and HA014/09, comprising high quality bedding mortar, interlocking, mono-polymer bricks (BS5834 and EN124), polymer modified mastic grout and H grade, cold polymer mastic asphalt blocks (BS1447:1988). The cold blocks are designed to absorb the heat from the hot liquid grout whilst forming a monolithic structure with the mono-polymer bricks, which are in turn supporting the frame and cover. The system cools to an ambient temperature faster than other hot applied systems allowing repairs to be completed and the area to be re-opened within restricted working periods. Pre-coated chippings or 2-5mm aggregates >60 PSV are applied to the finished surface to provide a non-skid surfacing surface. IronGuard can incorporate recycled coarse aggregate. It is voidless, requires no compaction and in many cases can be trafficked within an hour of completion. When using IronGuard there is no waste and no need to collect hot materials from an asphalt plant. 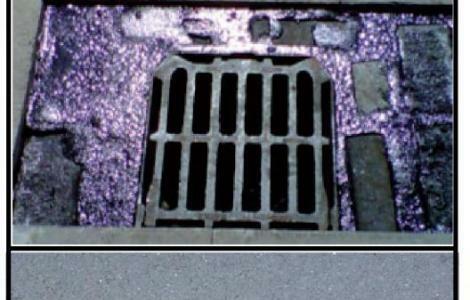 IronGuard is suitable for use on all inset ironwork including manholes, gullies and hydrants. 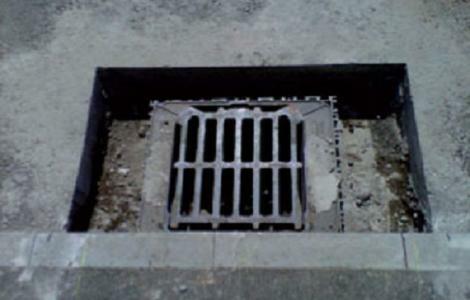 Installation cannot be carried out during heavy rain or where there is running water. Mark out the area to be excavated around the frame of the failed ironwork. All perimeter edges around the failed ironwork must be saw-cut to ensure a clean vertical face. Break out the materials and remove all spoil and debris and the cover and frame. Any loose debris can be removed using hot compressed air and care should be taken to stop debris falling into the shaft. If re-using the existing frame remove all old bedding material and any debris from the frame in preparation for reinstallation. Apply the quick setting IG bedding mortar to the base of the excavation to a maximum thickness of 50mm. If the area to be repaired is concrete a primer must be applied and allowed to cure for approximately 15 minutes before installing the IG Bricks, grout and blocks. Reinstatements in asphalt do not require priming. Place a layer of IG interlocking mono-polymer bricks onto the IG bedding mortar ensuring that as much of the mortar is covered with the interlocked bricks as possible. Reset the new/existing ironwork on top of the bricks so the frame is level with the surrounding surface and allow the bedding mortar to cure for a minimum of 15 minutes dependent on the ambient temperature. In a thermostatically controlled mixer heat the IG polymer modified mastic grout to between 140-160°C. To avoid any localized overheating of the grout during the melting process always keep the mixer paddles turning. Once the grout has reached its optimum working temperature and is thoroughly mixed, pour the heated grout into the excavation to a depth of 20-25mm, ensuring all faces of the excavation are covered. Lightly bed the IG blocks into the hot IG grout with sufficient space between them to allow the grout to flow and fill the voids around each block. Allow the grout to cool. The IG blocks give extra strength to the reinstatement and act as a heat sink, drawing heat from the grout. For deeper excavations rebuild the sub-base to the bottom of the binder base course before applying the IronGuard system. Fill the excavation with a second application of the hot IG grout and hand float the surface of the grout to ensure the material is level with the surrounding road surface. Cold pre-coated chippings, or 2-5mm aggregates heated to 140°C and with a PSV >60 should be pressed into the grout with a wooden float whilst the material is in a warm plastic state (75-90°C). Allow the reinstatement to cool to ambient temperature before opening to traffic. The curing time will greatly depend on the ambient temperature. Initial cure can occur within approximately 2 hours but full cure may take up to 12 hours. During the first hour of curing traffic must not be allowed onto the treated surface. Once fully cured sweeping or vacuuming can take place. Enfield, Co. Meath, Ireland, A83 PF96. Charlestown, Co. Mayo, Ireland, F12 TV06.